If you would like to make a single donation, schedule ongoing contributions or change your level of giving, you can accomplish it all online. 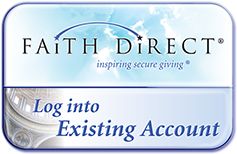 With Faith Direct, our online giving provider, you can give by using your checking account or credit card. This safe and convenient option is one of the easiest ways to support St. Matthew and its charitable outreach. As well, it reduces cost for the church and is an environmentally responsible option. You will be able to securely access and make changes to your account any time online or by calling them directly. There is no cost to you for joining or making your donations through this program. Donation cards are provided by Faith Direct which should be used weekly to indicate your participation in this program. Click here to give to the Diocesan Support Appeal online. Please be sure to list St. Matthew Catholic Church as your home parish.